Maxi-Cure™ – Unscrew top from nozzle. For finer applications, use the extender tip. 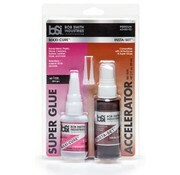 Apply Maxi-Cure™ CA to one side of the parts being joined, then hold them tightly to- gether for 10-20 seconds. For larger bonding areas, apply serpentine beads of the CA with enough spacing to allow for the spreading of the adhesive. Insta-Set™ accelerator can be sprayed to cure the CA that oozes from joints. Full strength is reached in three hours. Wipe the nozzle clean before replacing screw-on top. Refrigerate to extend shelf life. Cured CA is stable from -40 to 220° F. Soak extender tip in acetone for cleaning. 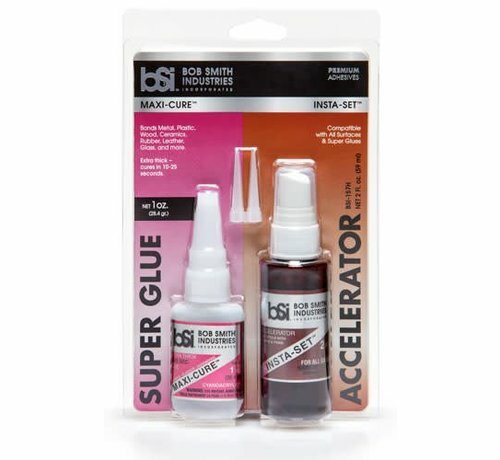 Insta-Set™ – After joining parts with cyanoacrylate (CA, super glue), spray the seams with Insta-Set™ to cure the CA in 8 seconds. A bead of CA can then be applied to the outside and corners of joints before another application of Insta-Set™ to reinforce their strength. 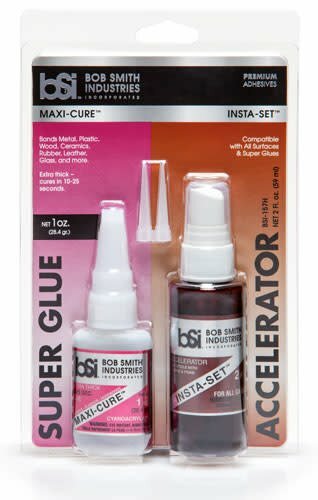 Insta-Set™ can also be applied to one part (with CA on the other) before joining for difficult to bond materials. Insta-Set™ is compatible with all surfaces, including clear plastic and all foams. It also is a great cleaning agent for adhesive residue and scuff marks. Store separately from CAs.